Second Tuesday means it’s time for me to get creative over at My Crafty Spot! A few weeks ago I was DEEP in the crafting mindset during a trip to the Dollar Tree. I think I was there buying 1500 thumb tacks for an upcoming project. Anyways, I got distracted by pompoms in perfect spring colors. There were only three packs left, so I snatched them up before I had to fight off any other crafty ladies. 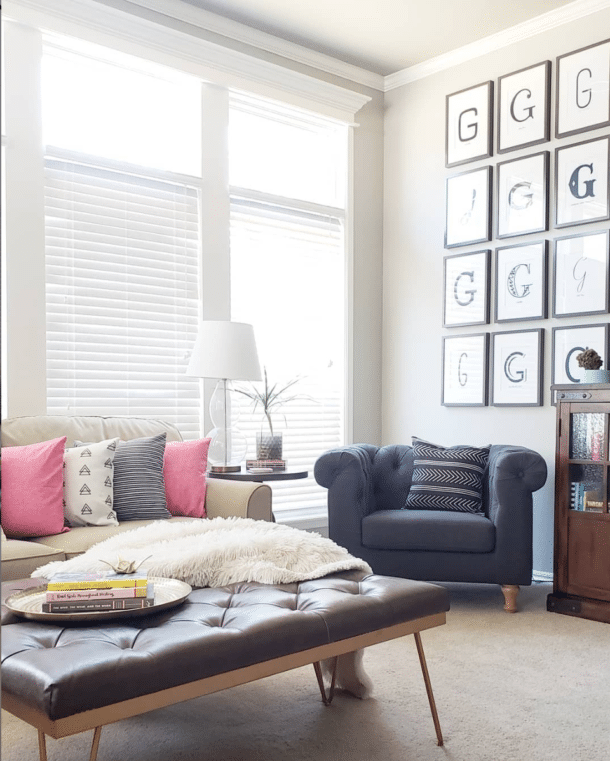 I picked up a few other things, and my super soft, multi-purpose accent pieces were born! Head over to My Crafty Spot to see the tutorial and not just one, but TWO ways I used these fun balls to style a spring dining table. But they aren’t just good in the dining room, they work on a mantel or display shelf too. Balanced on candle sticks, they add some spring whimsy to my shelf! I was able to put this whole look together without buying anything new, except the fresh flowers. The mason jars are Target Dollar Spot finds from awhile back and the picture frames were borrowed from other rooms in the house. Don’t forget to shop your own house for seasonal displays. 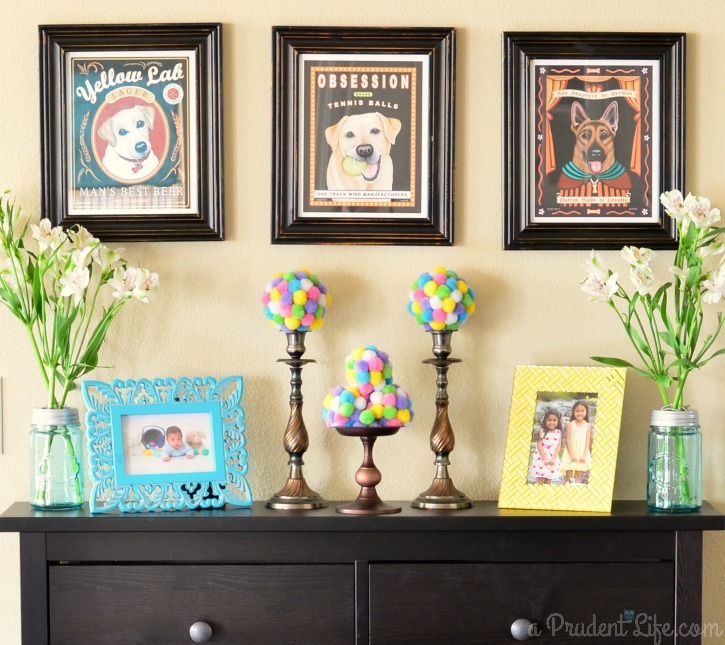 These frames stay out all year in their normal rooms, but when you bring them together with other springy items, they seem like I bought them just for this area. 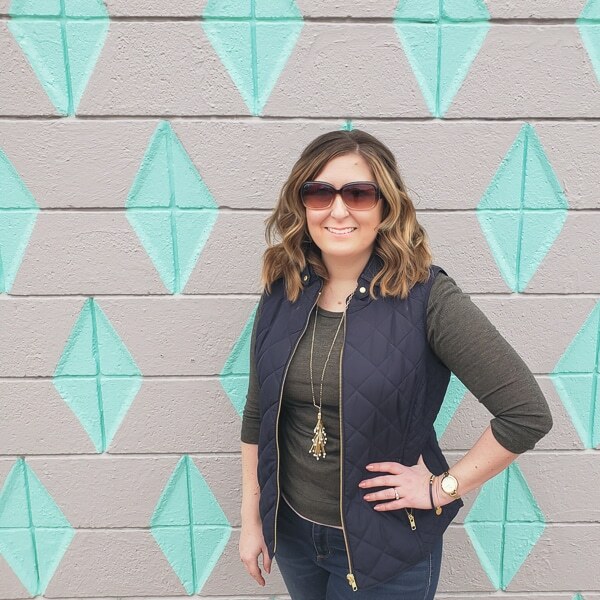 Don’t forget to check out the full post on My Crafty Spot! Those are so adorable! I love the dog pictures above them too! 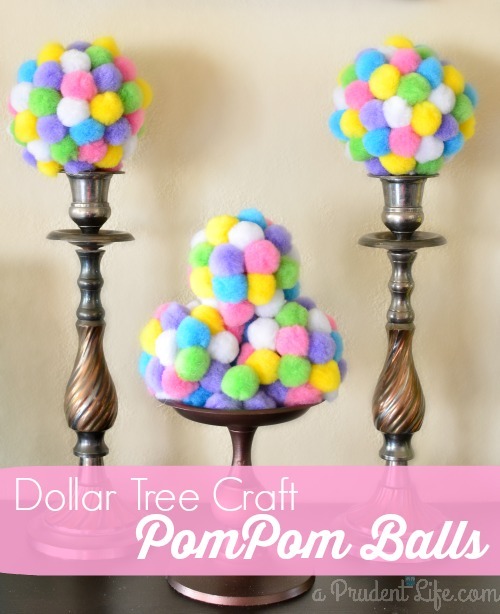 I love pom pom crafts. They are SO cheap and make the cutest things. Love this! Thank you Daniela! Somehow it’s the first time I have ever played with craft pom poms!